There have been a lot of games that dabble into the theme of Ancient Egypt, but there isn't a lot that has managed to grab players' attention long enough to make them come back to those games again and again. However, when you play a game that has been developed and design4ed by Yggdrasil, there is a very big chance that you will return to playing that same game in your next free time. If you're up for different games, you can always find online video slots here now! 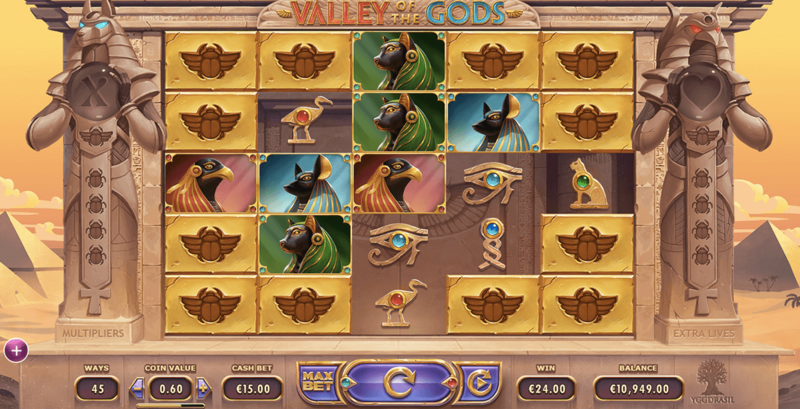 Valley Of The Gods is an online slot game that takes you through the wonders of the great pyramids under the guidance of the great gods Anubis and Horus. The wonders that will give you a very hefty payout that will leave you smiling for hours after you've finished the game! The Malta based iGaming developers behind Yggdrasil have gained recognition within the industry for their task to always think ahead into the future of online casino gaming. Founded by NetEnt's former CEO, the brand has the vision to create some of the most advanced games for the market that are almost out of this world. Well, since their name was inspired by Scandinavian mythology, you can definitely say that their products are out of this world! The amount of good customer support and modern technology will certainly get you trying out some of Yggdrasil's games. 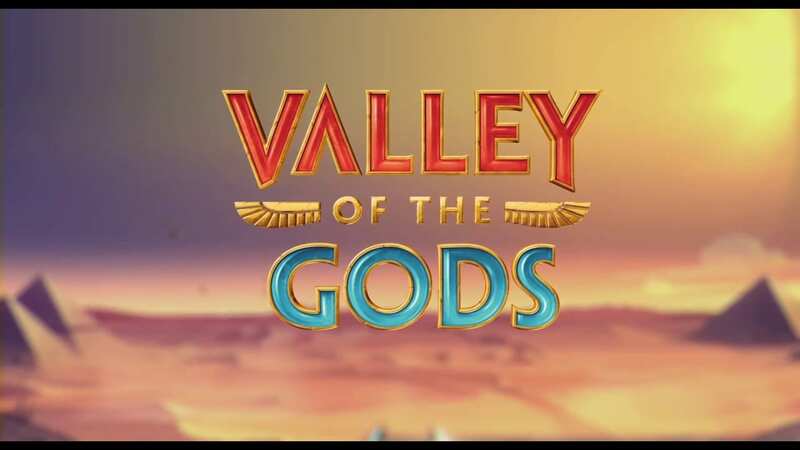 With that being said, how could you be sceptical about playing Valley Of The Gods, when their other games like Robotnik and Trolls Bridge have received so many fantastic reviews from the people that have played them? There's a lot to learn about UK games of slots. In the introduction, you see yourself following the sacred scarab beetles will lead you towards the game and show you what the great sands of Egypt have kept hidden for so many centuries. Your 5x5 reel grid will be fixed by stony pillars with the shape of the great gods carved at the top. Here's a guide especially for new players to read more. The left pillar represents the multipliers meter, and the right pillar represents your lives meter, which when emptied, the game will end. This game differs from some of your more classical slot games with the icons that the developers decided to implement in it. The base symbols with low payouts come in the form of hieroglyphics with a sacred gem embedded in the centre, and the base symbols with high payouts come in the form of the great Egyptian gods themselves. There are also blocks with the scarab symbols that block some of your reels and keep you from your prizes. But if you get a winning combo on the reels, the blocks get destroyed. In the great sands of Egypt, there are many mysteries that can leave you with great surprises on your adventure. So, here are some of the special symbols and features that you're going to have to watch out for. Scarab Multipliers: You receive the multipliers from all of the scarabs that you'd collect. 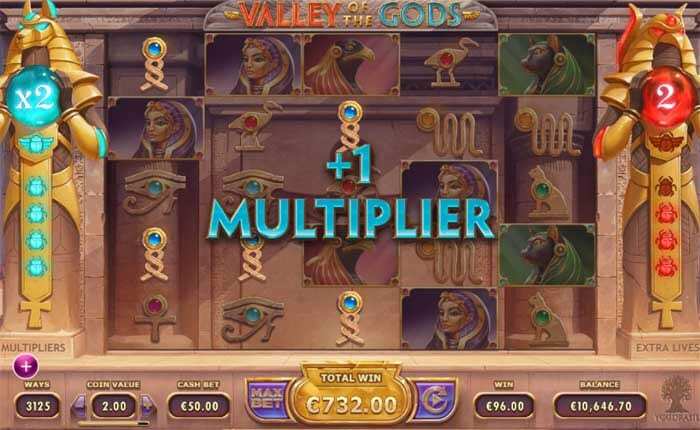 For every 5 scarabs you collect, you get 1 multiplier of 2 to add to your winnings. Extra Lives Feature: Every time a Lives feature is triggered, a life will be spent from the right pillar. You can gain more lives by continuing to get matching combos on your reels and collecting the scarabs that scuttle across your screen. Re-Spin Feature: Every winning combo you get rewards you with a free re-spin, which increases your chances of winning big prizes.